In Speed, the 1994 movie starring Sandra Bullock and Keanu Reeves, it was a speeding bus that created the drama. 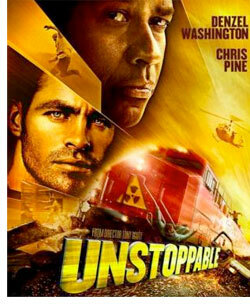 For this film it’s a speeding train. But this film has something going for it that Speed didn’t. This story is based on true events, and thus why it’s getting a mention here. Now just how much is fact and how much is fiction I can’t say. I did do a little research and found that many of the plot points in the film were actually true. The filmmakers claim that the movie was inspired by real events, which normally means that there is more fiction than fact. But who cares. This was a fun picture. I liked it better than speed because of its true story angle. Denzel Washington and Chris Pine are great in the roles they play, but this is one of those films where the directing, writing, and editing are equally important to the end result. From a writing standpoint, I liked how the writer/writers worked in the character’s back stories. Though I would have liked a few more scenes at Hooters. I’m from Pennsylvania where the film takes place. In fact, I grew up in the small town of Conway, Pennsylvania, which has the distinction of being the largest push button railway interchange in the world. All I know is that we lived on a hill miles from the railroad, but on a cold, still night you could hear the sound of railway cars screeching and banging. Bottom line. This was an entertaining film worth seeing on the big screen vs waiting for the DVD.